If you have been looking at bedding linens but are not sure which ones to buy there may be some words you have seen that have you asking even more questions. Such as what is percale? We’re going to teach you everything you need to know about percale. Percale is a cloth that is woven out of cotton, polyester or a combination of the two. From 100% polyester to a 50/50 mix to 100% cotton the percale family of linens run the gamut. How it’s Made – Percale is different from other cloths in the way it is colored to make your finished linens. Instead of being dyed like many other cloths, percale begins as a grey cloth that is then sprayed to take on the color you will ultimately see. Color and Feel – Because of the way it is colored, how dark a percale piece is can impact how it feels. Since there is a build up of color on the fabric, the color can impact the overall feel of the material. This means the darker the color, the stiffer the fabric will feel. Thread Count and Feel – It is important to note that there is more to think about then thread count when you are considering a percale linen set. The thread count is only part of the equation. Since polyester is not as soft and comfortable as cotton, you also need to take note of the combination of cotton to polyester. A higher polyester content at a higher thread count will still not feel as good as a higher percentage cotton with a lower thread count. Shrinkage – Percale sheets will shrink the first few times you use them. Thankfully, most manufacturers keep this in mind when making them and make them a littler larger than they need to be so when they do shrink they will fit just right. This Freckles Urban Tie Dye Sheet Set is a fun set to dress up your kids or tweens rooms. The sheet sets are available in blue and olive and you can mix and match the set with the Freckles Urban bedding collection. Reminiscent of the hippy days the sheet set has a splattered tie-dye design that matches the coordinating patchwork quilt and sham (sold separately). The pillow case and the oversized flat sheet are both finished with solid, coordinating hemstitching, and the fitted sheet has all round elastic so that it fits snuggly around the mattress. The sheet set is made from 100% machine washable. 180 thread count combed cotton in a luxurious percal weave. the two pillowcases measure 19″ x 29″ each. This cool funky Urban sheet set was Designed in Australia. 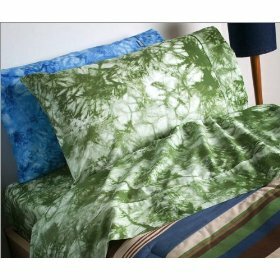 Where Can I Buy the Freckles Urban Tie Dye Sheet Set?